I’ve never been to Germany but would love to. The closest I have got is when the German market sets up in my friend’s home town of Birmingham at Christmas. I always strategically plan to visit him at this time so I can sample the fresh waffles, bratwurst, and beer on offer (and for a catch up, obviously). The pretzels served up there are as authentic as they come. This recipe comes pretty close and you can have fun experimenting with shapes too. It’s a good idea to start this recipe a day in advance to let your starter develop a really yeasty flavour. Add 100g of flour, all the yeast and the water into a bowl. Whisk, cover with cling-film and leave in a warm place for 5 hours + to create the yeast flavour. After that, add the rest of the flour, salt, milk, sugar/malt extract and melted butter. Mix and kneed the mixture to make a firm dough (around 10 minutes) and leave for approx 1 and a half hours or until a point pushed in gentle springs back. When ready, knock the dough back and start forming shapes. Roll the dough out to be a long (40 cm) rope with the middle 5cm bulged to a diameter of around 3 cm, tapering to the ends being around 0.75 cm thick. Bring the two ends together about 5 cm in, overlap them, twist, and bring back to go over the main body. Almost like tying a knot. Leave for 30 minutes uncovered in a warm room to rise and develop. In the meantime bring the 1 litre of water to the boil in a large pot and add the baking soda. If you can find food grade sodium hydroxide (lye) use that at 3-4 tbs per litre, but be VERY careful and DO NOT let children near it. ALWAYS wear gloves and eye protection, or do as I do and go nowhere near it! Once the dough has risen, place the trays next to a cold window with some wind blowing. This develops a skin on the pretzels which gives that special chewy texture. Once done drop the shaped dough into the boiling solution (one at a time) until they float (about 5 second), fish out with a fish slice (or similar) and lay on a baking tray lined with baking paper. Sprinkle with sea salt (lightly at first, you find your own taste preference later) and slash the dough to a depth of around 1cm in the thick part at the top-back. If you want to top with cheese, leave off the salt, and add the cheese once the pretzel is baked, so 5 to 10 minutes extra in the oven later. 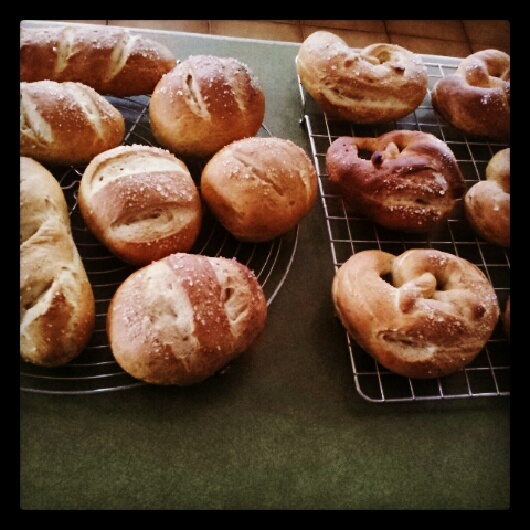 Add the baking sheets to the 200C oven for around 16-20 minutes, until a nice deep bready brown is seen on the pretzels. Don’t go for gold or chestnut, go for brown, the flavour goes with it! Remove from the oven and allow to cool completely on a wire rack. They taste good warm, but better when cooled and crisped. Even though it has been forecast and even though it is the end of July, I’m still always surprised when the sun comes out. 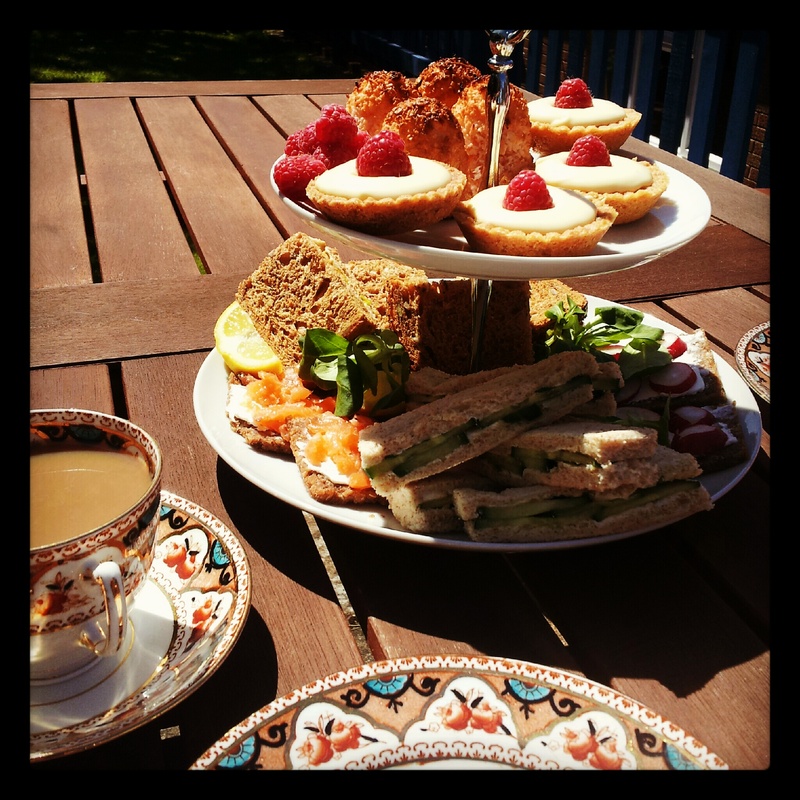 But what better way to take advantage baking style and create a lovely English high tea to sit out in the garden and enjoy with friends. Not going to lie, it also gave me the perfect opportunity to use my new china set – so pretty. Pre-heat the oven to 180C. Line 2 baking trays with grease-proof paper. Measure the coconut and sugar into a bowl and mix together. Beat in the egg to bind the mixture together and add a few drops of colouring, if desired. Dip an egg cup in cold water and drain it well. Fill with the coconut mixture and press down lightly. Turn the moulded coconut onto the baking tray and continue with the rest of the mixture. Bake in the pre-heated oven for 20 minutes or until the pyramids are tinged a pale golden brown on top. Transfer them to wire racks and leave to cool. These are more like domes than any pyramid I’ve seen but the important thing is that they taste lovely. You could experiment with colours, separate the mix into little bowls and add different colours to each if you like. First make the shortbread. Soften the butter/margarine in a bowl, add the sugar, semolina and flour and work together to form a smooth dough. Wrap in cling film and chill the dough in the fridge for about 15 minutes. On a lightly floured work surface, roll out the shortbread to 5mm thick. Cut out circles using a 3in/ 7.5cm fluted cutter, then ease the circles into a bun tin tray. Prick the bases well with a fork. Bake in the pre-heated oven for about 20-25 minutes or until firm and golden. Leave the shortbread to harden slightly in the tins then gently remove to a wire rack to cool completely. For the filling, mix together the lemon curd and the whipped cream. Just before serving, spoon a little of the filling into each shortbread case and top with fruit of your choice. The shortbread can be made ahead and even frozen. Once filled, however, they go soft quite quickly so eat straight away. These are so buttery and crunchy that this should not be a problem. The rest of the tea in the picture is a mixture of sandwiches including cucumber and cream cheese, smoked salmon and coronation chicken. Yummy! My second bake and my second post in 2 days! So, after making all those peanut butter, banana milkshakes for the lovely sunshine we’ve been having, I still have a rather large supply of peanut butter left over. 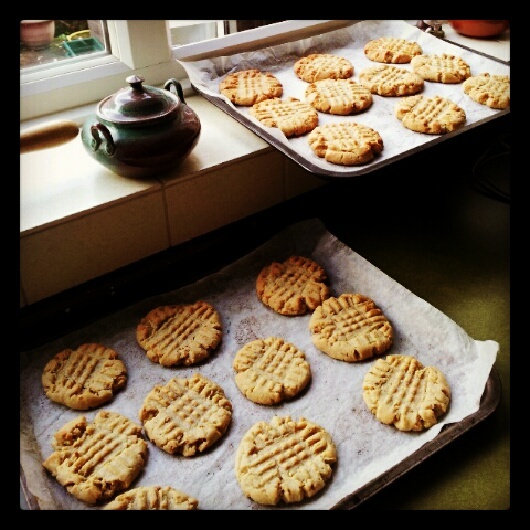 while that’s never a bad thing, I thought I’d put it to good use and make some gorgeous (if I say so myself) peanut butter cookies. I think the secret to these is a good pinch of salt and not over-baking. Combine margarine, peanut butter, sugars, egg and vanilla and beat together until well combined. Add the flour, baking soda and salt and mix in well. Chill the dough in the bowl for 15 minutes in the fridge. Roll the dough into golf-sized balls by hand and place on lined baking trays. Using a fork, press down on the balls to create a criss-cross pattern then bake in the oven for 7-10 minutes or until the edges are very lightly beginning to brown. Remove from the oven and allow the cookies to cool on the trays before removing to a wire rack. Maybe putting these cookies by the window-sill to cool wasn’t such a good idea as the amazing smell as people walked by meant they didn’t hang around for too long. Maybe these should be called ‘one week a year flapjacks’ because it seems that in England, this is the period of time for which there is sufficient weather warm enough to turn your bananas ripe. I mean ripe as in opening the cupboard and being greeted by an immediate banana aroma and spotty yellow skin that would make an adolescent Simpson blush. I love bananas so I always have a supply in the house and they never hang around long enough to ripen but on the rare occasion that they do, it is an excellent opportunity to make all things banana: banana bread, hummingbird cake, banana & peanut butter milkshakes and of course, banana flapjacks. The great thing is that these flapjacks keep very well for up to a week if stored in an airtight container (and not eaten in one sitting). Preheat the oven to 180C. Line a 9×13 baking tin with foil and lightly grease. Melt the margarine, sugar and golden syrup in a large saucepan over a gentle heat until melted together. Turn off the heat and stir in the oats, baking powder and salt. Stir in the mashed bananas and sultanas if using and mix well until thoroughly combined. Spread the mixture into the prepared tin. Use a metal spoon to smooth the surface. Bake for 20-25 minutes or until the edges are turning golden brown and it feels fairly firm. Remove from the oven and cut into bars immediately. 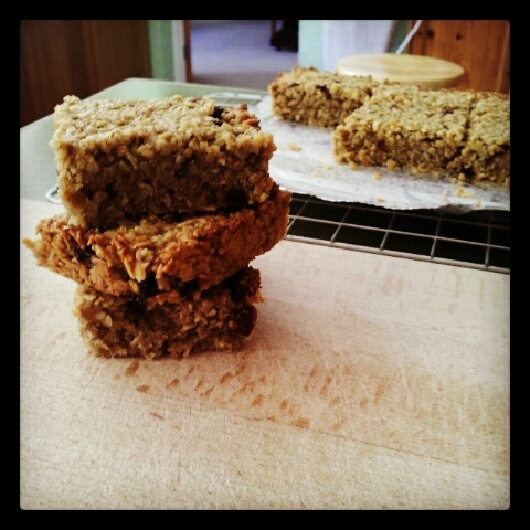 Leave the flapjacks to cool completely in the tin before transferring to an airtight container.